Im MARK KHERWIN SENORIN from VIVA SEN WATER TREATMENT. Its so simply to start! WATER REFILLING STATION one of the fast growing business nationwide, you can see it any on any street especially in metro manila. Many people seeking for their good, pure, and safe drinking water. It is simple PURE Safe, PURE Clean, PURE drinking water, PURIFIED WATER. 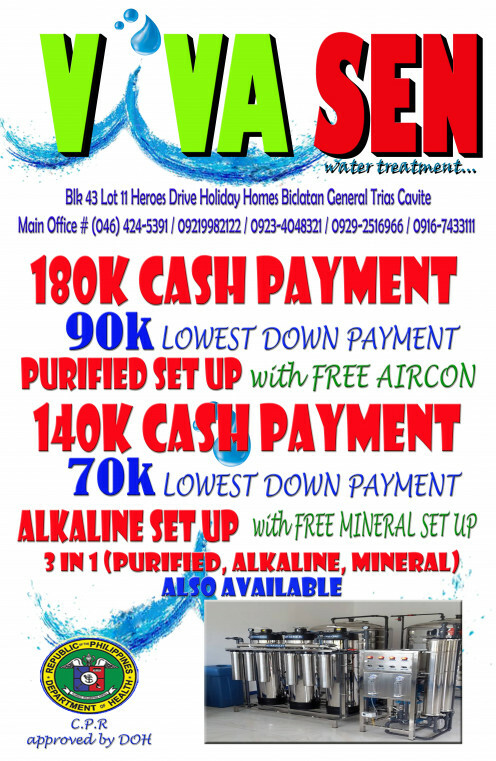 VIVA SEN WATER TREATMENT gives you a low low low price, cheaper solution and convenient price of WATER PURIFICATION SYSTEM guaranteed 0% Interest, No Franchise Fee, No Royalty Fee, No Hidden Charges. Its just simply…This will be done after inquiry or closing negotiation with us…. This is the time to order your equipment, 50% of the payment are normally due upon placing the order and the remaining 50% upon installation. Its takes 3 weeks maximum upon delivery installation of your equipment. So while waiting for your store renovation to be completed the equipments are ready to be installed. Also while renovation is on going you can apply for business permit to save time. Look for a place where you can put up your water refilling station at least 20 sqm (Store) If you don’t want to rent and there’s a space in your house that you can used at least 20-25sqm and do renovation / construction, contact us for further needs like site inspection and store layout it is depends on your location estimated price Php60,000.00 for renovation construction and contractor (under negotiation). Posters to hang around the store when renovation is on going are important. This is a part of your marketing Strategy. Checking the source of water for Deep Well, Nawasa, Maynilad, or Any Water District are also included in our site checking we have to check the TDS of Water and examine it for laboratory to know what’s the best equipment or filtration are needed. Water Testing may be required by local health officials. We recommend store layout therefore we can give our clients the best layout for the store and strictly followed especially the washing area, like Lavatory, Piping, Drainage Area, Door Entry, location of Equipment and Electrical outlet, So that the client have the idea for renovation / construction of the store. 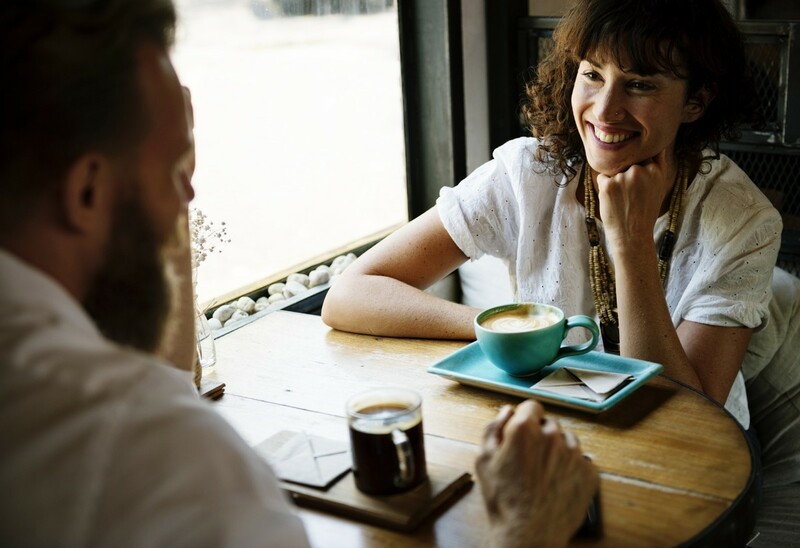 Inventory should be ordered 2 weeks before your opening date it is important to do it early just in case the supplier does not have them on stock. Outside store signage must be installed before opening your store. Hi, kindly send me a quotation about 3 in 1 package, pls incude also the inclusions and exclusions of the package. Thank you. Purified, alkaline and mineral or 3 in 1. Hi, could you send me details and proceedures aswell as mode of payments. expecting to here from you very soon. niebabe.atienza@gmail.com. Good day po,pewede ko po bang malaman kng nag kkontrata kayo sa istablish ng water refelling station sa province of Quezon..tnx po..pwede nyo po ko mamail sa email: buerano.teresajoy@yahoo.com.. Please send me a quotations for 3 in 1 package. i am relly interested. My location is in Lian Batangas near Matabungkay. Can I request please a complete quotations of 3in1 package, location is Mindoro province, Thank you. hi, kindly send me a business proposal with complete details and information about your water station venture. i am very interested to open this kind of business,thank you and best regards. please send me a quotation of your equipment including terms and conditions and packages.I want double membrane equipment. Kindly send me the quatation, terms and condition of stated above. please send me the quotation for the best deal & packages. Please send me quotation for best equipments, terms and conditions and software for inventory; all in package for setting up the water refilling station (if possible include expected costs in construction of place) on my email: aroyupa@yahoo.com. Kindly send me the best price, proposals, brochures and packages of machine for the equipment stated above. We are a UAE Investment consultancy, seeking Philippine Investment Opportunities on behalf of our client. We will appreciate proposals related to Green Energy, Eco Preservation, Real Estate, Tourism, Hospitality and Construction. Kindly send me a quotation with terms and condition I am planning to put up this kind of business here in my place....e-mail me my queries at mauezednanref@gmail.com hoping for your prompt reply. Can you please send me quotations for all your prices, with terms and conditions. and i am lloking 4 gud equipments and good prices. Do you have any branch office in pangasinan where we can inquire your product.We are enteresting to put up a business of water refilling station. Can you please send me price quotation, and what is included in the package. Cash basis and installment. Hi im interested and would like to ask for the full package quotation of this . How much for cash basis and installment. I want to put up a water refill station. What can you do for me? Hi! I am interested to have a water refilling station here in Samar. Would you please send me all the business information to jc33t59@comcast.net. Thank you. hi,,, can i have your quotation for the 4-in 1 which im intereted to open a business such water refilling station in zamboanga city pls....my Email ( greganae@yahoo.com thank you verry much. I am also interested to franchise this busness, we curently here in abroad, sir can u pls give all the quotaion..
Kindly send me your quote, type of purification process, and other expenses at javidrenato@yahoo.com. The construction of my proposed buidling in Cordon, Isabela is in-progress, please send me ASAP a Typical Lay-out of Water Refilling Station for us to follow the same. kindly send me the quotation of this type of machine and related expenses therein. And is this available in puerto princesa palawan? the 50k downpayment how much the monthly and how many years to pay? thank you and godbless.. i need asap response..
the 50k downpayment how much the monthly and how many years to pay? thank you. i need asap response..
Kindly send me a proposal. Thanks. do you sell these outside Philippines? Please send me a quotation for your equipment. I am targeting production capacity of 3000-4500 gals/day. Hi.i am interested in putting up a water station in pangasinan..
hi,my family is planning a water refilling business .our place is in iloilo.our water source is a natural mountain spring.can you please give us any idea on what machine are we going to purchase and how much it cost.thank you so much.my email is mremelyn05@yahoo.com. I want to make this business in my place Cagnocot,Villaba,Leyte. Kindly advised how much total cost for me to build this business. i'm interested to put up this business. pls email me at jamesqatar65@yahoo.com kindly send me info,quotations and other details. by end of this year plano kong mg open ng WRS,I' looking for a good package deal.Pls send a complete details on my email eev_7@yahoo.com. Im planning to put up a WRS, and I'm currently canvassing quotations from different suppliers/franchisers. I would like to inquire if you will set-up an d install in camotes island cebu, please send me your package deals, requirements and after-sales services. I'm also interested. Please email me at rlcubid@yahoo.com.sg. Please provide me some information to put up this business. I'm very much intrested on this kind of business pls. email me at yeisha_17@yahoo.com all the needed information regarding this water refilling station installation. My friend from QC recommended your company . I am interested to put up a water station business and install it in our house. Can you please send me quotations. How much downpayment and if I want o pay by installment. How about the gallons and other equipments needed. Hi. My friend and I are interested in putting up a water refilling station in Sorsogon, Bicol. Can you please send me your quotations, full packages and details at this email address - sweetymi223@yahoo.com. Please send me quotations, packages and full details at lynvillamater@ yahoo.com,, hope receive it soon. I am also willing for a sit down meeting with you. Thank you. Please send me details and quotations on how/how much will it cost to put up a Water refilling station . Thank you. Godbless. Can I have your mobile contact number? please contact me through this number: 0933-6351842. I am from Gensan, hope you have the branch. I am planning to put up a water station in my town, would it be possible to send me quotations,prices,terms and conditions for me to read please.My email add is n29_ranjo2yahoo.ca. Very much appreciated. I am very much interested in putting up water filling station here in my place. Could you please send your system package, prices terms and condition. Or if you are giving a rent to own scheme, what the cost will be in a manual filling system. im planning to put up water reffiling station + laundry at the same place... can u send me a quattation 4 it... tnx! my email is juddsantos22@yahoo.com.. tnx! Hi interested here from Mindanao (Gensan Area)? Kindly send me the proposal and quotation of your 3 in 1 water system products including terms for installment basis. Can you please send me quotations for all your prices, with terms and conditions. and i am looking 4 gud equipments and good prices. Good day! I am very much interested in putting up this business. Please give me the full details from the Type of Equipment, Prices,Term and Conditions, Payments Terms and Sample lay-out of shop. Please email at xxll_nikay_llxx@yahoo.com. Thank you very much. I'll be coming to manila in two weeks to talk with FRANZAVIAN-a water station equipments provider but then I happen to came at this site and I think it is but wise to ask for your package in order for me assess the best deal for my investment. I am interested in putting up a Fully Automatic 3-in-1 System (Purified-Mineral-Alkaline)here at Tuguegarao City, Cagayan. Please do send me your business propasal for the above-mentioned package at my e-mail----ericley_lazaro@yahoo.com. Hope to hear from you soon. I'm interested to put up this business. Please give me the complete details about his business. Hi..Is this available for Bacolod areas?If yes, please kindly send me the proposal and quotation of your products. Hi, I am very much interested in putting up this business. Please give me the full details from the Type of Equipment, Prices,Term and Conditions, Payments Terms and Sample lay-out of shop. Please email at sheka1113@yahoo.com. Thank you very much. I'm planning to put up a water refilling station in Visayas area, Malatapay, Maluay, Negros Oriental. Pls send me your price quotation at my email address, sophialumantod@yahoo.com. Sir, my dad is planning to operate a water refilling station..
We are currently doing a research studies about it. the machine is most likely low investment for about only 75,000-100,000 vs the purifying machine with reverse osmosis 21stages or whatsoever that cost 250,000 up to half a million pesos. The main reason is that I just wanted to know your advise and opinion as an expert in water refilling business. Tnx. Email me at this address. Am interested in my location here in Sta. Ana, Pampanga. Thanks. sir, i am very much interested to have a water refilling station in zamboanga city, can you please help me by sending all the quotations for your packages. here's my e-mail add. : ives_aminulla@yahoo.com.ph.